If you have a large collection of messages in Apple's Mail app you may have noticed the search function can be slow and frustrating. Mail includes a dynamic search system known as Smart Mailboxes that can speed things up and assist in organizing your email messages. Normal search tends to bring up so many matches that trying to wade through the list is in itself daunting. When you try adding search filters to narrow things down, the results can be less than helpful, with either no matches displayed, or no real change from before the filter was applied. A Smart Mailbox will display all of the messages that meet the criteria you specify, even if they're stored in different mailboxes. A Smart Mailbox will also dynamically update itself whenever you receive new messages that match its criteria. The dynamic update is one of the key reasons for using Smart Mailboxes. A simple glance into a Smart Mailbox will usually reveal the message you're looking for, without a great deal of effort on your part. To create a Smart Mailbox, select New Smart Mailbox from the Mailbox menu, or, depending on the version of Mail you're using, click the plus (+) sign in the lower left corner of the Mail window, and then select New Smart Mailbox from the pop-up menu. In the Smart Mailbox Name field, enter a descriptive name for the mailbox, such as Fields Project, Inbox Flagged, Unread Messages, Attachments, or Mail From Uncle Harry. Use the dropdown menus to select appropriate criteria. You can search messages that match any or all of the criteria you specify. Click the plus (+) icon to add more sorting criteria. 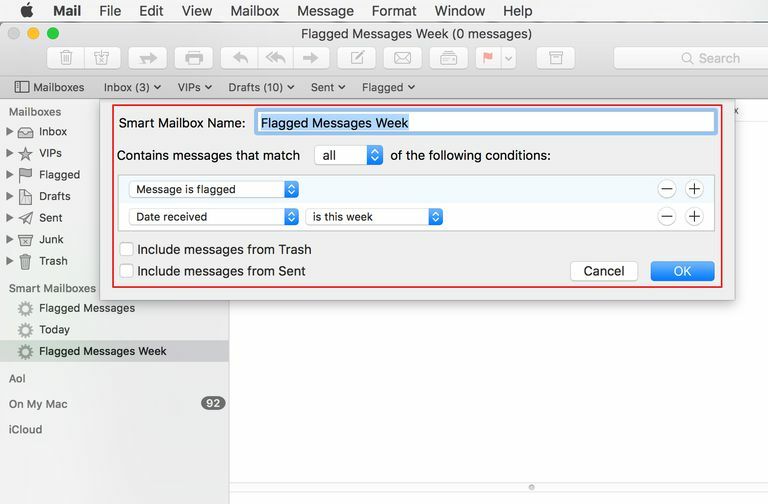 The criteria can include messages in the trash and messages in your Sent mailbox. Click OK when you're done. The new Smart Mailbox will immediately go out and find all of the messages that match its criteria. This may take a few minutes, especially if you only specified one or two search criteria. Don't forget that anything you do to a message in a Smart Mailbox affects the original version of the message, so be careful not to delete a message in a Smart Mailbox unless you truly want to delete it. You may notice after you create a Smart Mailbox that its content isn't exactly what you were expecting. Normally, the problem is in how you set up the criteria for the Smart Mailbox. Right-click the Smart Mailbox in the sidebar and select Edit Smart Mailbox from the pop-up menu. This will display the Smart Mailbox creation box. You edit its contents anyway you see fit. You can add criteria or change the existing parameters to better meet your goals for the Smart Mailbox. When you're done, click the OK button. If you create more than a few Smart Mailboxes, you may want to organize them into folders. Select New Smart Mailbox Folder from the Mailbox menu, give the folder a name, such as Work, Home, or Projects, and click OK. Click and drag Smart Mailboxes into the appropriate folder.